At the close of the thirtieth week of the year, I was in Barbados, and my sister and her husband had decided to carry us on a whirlwind of a tour of Barbados’ scenic points, I’m surprised I could remember where I took this one. I think we almost circled the entire island that day, starting from almost the southernmost point of the island and going eastwards around the coastline. 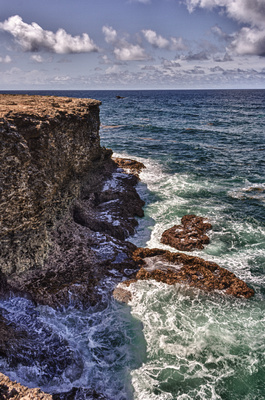 If my memory serves me correctly, this one was taken at North Point, from the name it’s likely the northernmost part of Barbados, and I was very engrossed with the view, but I managed to get some photographs in while admiring it. This is an HDR from three exposures, I hope you like it. I thought you forgot to take a photo for this week 🙂 Barbados could be a fascinating place for photography. Hope I get a chance to go back sometime, armed with a camera. If I don’t have to spend too much, I would enjoy it. The place is expensive, but beautiful!